The premise of "It's All in Your Head" is that we already have everything we need to be happy, because the "secrets"/tools are already in our "minds" - But we have to make a choice to shine a light on them again (remember them), and then get them out of our minds and into reality (use & experience them). others, or expect others to make us happy. bring us pleasure, but never happiness. most things, it takes work. The author suggests 8 "tools" to remember & use while you're working to create an attitude of happiness, and he also includes many different journal exercises to help you out along the way. I really enjoyed his use of personal stories to bring his thoughts/ideas/tools home - I think we can all find ourselves in at least one of these people &/or situations - which I find to be a another great way to solidify what I'm reading & learning. 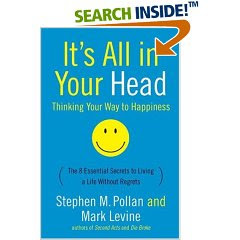 Overall, I found this book to be an enjoyable, insightful, helpful read on the topic of happiness. As such, I would highly recommend it to anyone looking to increase their own level of happiness - it certainly has a lot to offer!